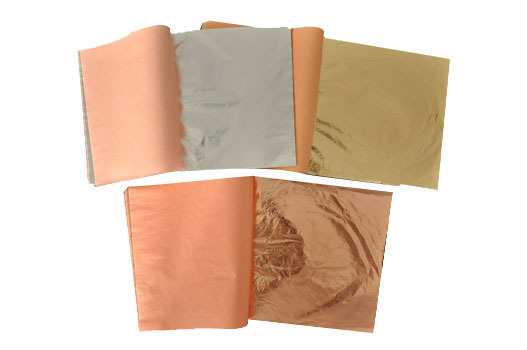 Metal leaf, also called composition leaf or schlagmetal, is a thin foil used for decoration. Metal leaf can come in many different shades. Some metal leaf may look like gold leaf but not contain any real gold. This metal leaf is often referred to as imitation leaf. Imitate gold leaf:colo2.5,also known as dutch metal leaf .The color 2.5 imitation gold leaf is composed of 85% Copper and 15% Zinc. Color 2.5 is similar to the color of 22Kt genuine gold leaf. Imitate gold leaf:color2.0,The color 2.0 imitation gold leaf is composed of 88% Copper and 12% Zinc. Copper leaf is made from base 100% pure copper. Imitate Silver Leaf is an alternative to silver leaf and whereas imitation silver leaf has to be varnished to prevent it from tarnishing, aluminum leaf needs no protection at all from oxidization.Imitate silver leaf also write aluminium leaf ,is 100% pure aluminium made it. Packlet:Each 6 leaves, 10 leaves ,25 leaves packed in 1 booklet ,Each 20 booklets(500 leaves) form a pack;Each 20 packs(10,000 leaves) packed in one polystyrene box;Each 20,000 leaves in one carton. Price is for single booklet purchase.